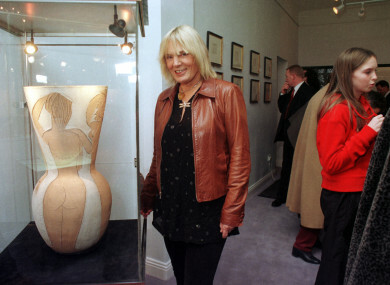 ACCLAIMED IRISH ARTIST Pauline Bewick has discovered at the age of 82 that the man she thought was her father was in fact not her biological dad. Bewick was speaking this week as she prepared for an appearance at the Listowel Writers’ Week Literary Festival in June, and after plans were put in place to move some of her stained glass work into the Grafton St Bewley’s. Bewick, who has a long and acclaimed career as an artist, told TheJournal.ie that she discovered recently about her biological father, a man named Gerald Massie Taylor, through a DNA test. In her book 80: A Memoir, Bewick had wondered about her parentage after her mother told her that she once made love to a man who called to the family home when Bewick’s sister was a baby. Taylor was 19, and Bewick’s mother Harry 33 when Bewick was conceived. Bewick said this week she saw symbolism in the fact that the discovery came after she had created a painting “of a man, a woman and a child – a very gentle, very beautiful one”. This painting, said Bewick, is one that comes from “part of my brain that I don’t understand but I let flow out” and which results in “huge amazing pictures” that take her a while to figure out. This process began after Bewick had a mini stroke four years ago. She discovered through this test that she was related to a man who was the son of Massey Taylor, who was from Newcastle Upon Tyne. “It’s quite a coincidence,” said Bewick, who has met a number of her rediscovered family members. Her mother was 33 and her father just 19 when she was conceived. “Her husband was an alcoholic,” said Bewick of her mother. She described her beloved mother Harry as an eccentric and wonderful woman, who moved her family to Ireland after her husband’s death. Bewick has lived an exciting and colourful life herself. The mother of two daughters – Poppy and Holly, who are both artists – she has written about her travels and relationships throughout her eight-plus decades. Well known for her watercolour work, she has also created stained glass, oil paintings and sculptures. That her stained glass work is to be moved into the Bewley’s on Grafton St means that her work will be seen by new eyes there. It’s also a time for Bewick to reflect on the times she spent in Bewley’s with her peers and friends from Dublin’s creative scene. “I think it’s exciting, I think it’s wonderful that Bewley’s is still existing, when it seemed threatened that we weren’t going to have Bewley’s anymore. What I love about Bewley’s is the mixture of people that go there. They could be children, mothers, fathers, tramps… There’s every type of human being going there, it’s fantastic.” She recalled some “very colourful experiences” at the café while young. Bewick said that at the age of 82, “it is very exciting to see the histories coming back to me now”. Bewick might have been active for decades, but she doesn’t dwell in the past. “I am a person who lives in the present – I don’t think back,” she said. Perhaps that’s why the discovery about her parentage doesn’t come as a shock to her. It’s another part of the rich tapestry of her interesting life. Email “'It's incredible': DNA test confirms identity of Pauline Bewick's biological father”. Feedback on “'It's incredible': DNA test confirms identity of Pauline Bewick's biological father”.